Tanzania - Africa's safari destination - Sunny Safaris Ltd.
Tanzania is a vast and mystical country, with breathtaking scenery ranging from the snow-capped peaks of Mount Kilimanjaro in the north to the rugged terrain of the plains of the Serengeti, that stretch west to the edge of Lake Victoria. Just off the east coast, lies the magical clove island of Zanzibar, with its intriguing blend of historical ruins, white sand beaches, and winding streets of old Stone Town. And in the south, the Selous Game Reserve offers a vastly untouched wilderness teeming with wildlife. Out of the 120 tribes which populate Tanzania, the most remarkable are the Maasai, who live a traditional, tribal lifestyle. Deeply connected to nature, these statuesque herdsmen can often be seen striding across the northern plains. It was at the Oldupai Gorge, in northern Tanzania, that anthropologists, under the guidance of Mary and Louis Leakey, claimed the discovery of significant links in the chain of human evolution. As custodians of Africa’s most spectacular wilderness, the Tanzanians are fiercely protective of their natural heritage. A remarkable 25 percent of her land is conserved under National Park status. These parks, famous world wide for their beauty and wildlife, are home to 20 percent of Africa’s large mammal population. They are safe havens for rare and threatened species such as black rhinoceros cheetah and painted wolves. The home to seven Unesco World Heritage Sites; Tanzania, with a climate and culture as varied as her landscape, offers visitors a wealth of experiences and a host of friendly faces, making this east African country an irresistible destination. 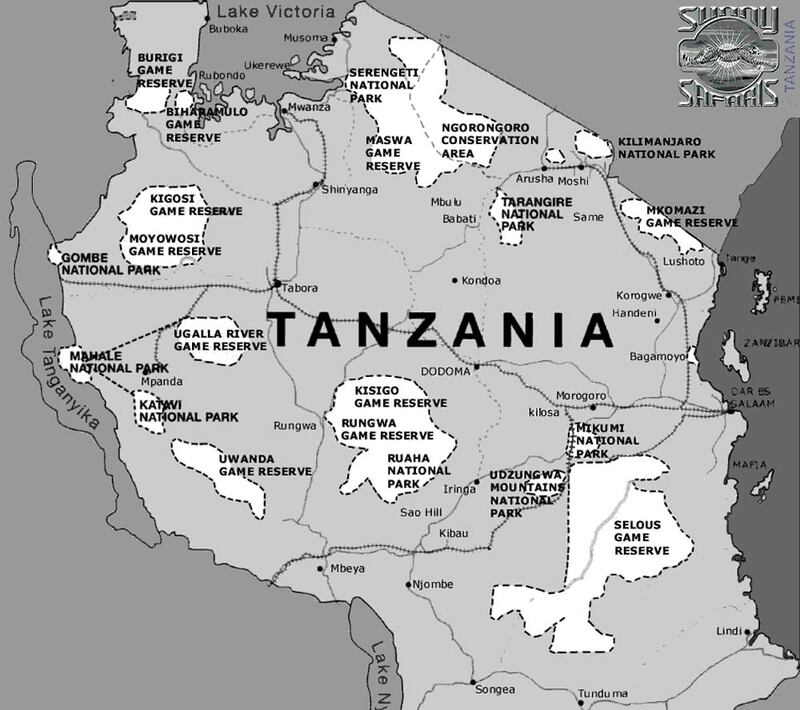 View more maps on our Maps of Tanzania page. View, download or print maps of airstrips for fly-in safaris, Kilimanjaro routes and where the great wildebeest migration is located each month of the year. Free information, quotes and recommendations.